From Siri and Alexa to Tesla’s self-driving cars, and Google AI, machine learning is conquering the world. AI is revolutionizing all the industries and digital marketing is no exception to the rule. The target of Artificial Intelligence in 2018 undoubtedly search engine optimization and the dynamically evolving phase. On account of social media outreach and massive data on account of browsing habits, AI offers exceptional customer experience, predictive analytics, and targeted marketing to provide a massive ROI for businesses. In previous times, digital marketers were so advanced when it comes to incorporating AI into their strategies. This reduced ambiguity results in more sectors reaping significant benefits. AI made its presence felt through big data, IoT and machine learning. How does artificial intelligence power online marketing? Personalizing user experience is an area where artificial intelligence creates a massive impact. A customer is king and content rules for marketers. If one can align the online content marketing intelligence with AI, it can be ground-breaking. Based on data collected such as buying behavior and interests, customer searches, customized content campaigns, every single customer or prospect’s pain points can be understood and the user experience can be personalized. Another way AI enhances the online marketing experience is through chatbots. These are programmed for interacting on the basis of data received. A multi-dimensional communication system with sensory abilities like voice search and touch points offer immense value. Augmented reality is another aspect of AI which can be leveraged to provide customers the option to see and feel the product prior to an actual purchase. This makes decision making easier for customers and increases the revenue. Each time user’s browsing on the internet, new data is generated and collated for AI analysis. Data reveals information such as behaviors, needs, and actions of users. On the basis of this information, online marketing supplies critical information. Social media outreach further shows personal information about prospects makes targeted marketing campaigns easier. This reduces sales cycles as relevant information is handed to the customer. Predictive campaigns further reduce customer reach on products and make decision making easier. For marketers, one can continue to analyze buyers through data and ensure the online campaigns strike the right chord with consumers. AI-enabled algorithms are set to change the way online marketing works. Previously, image recognition was confined to image objects. With AI-enabled software, a detailed description of images is possible. Amazon Recognition can even visualize and recognize human faces, emotions and identify objects. Technologies can be used in numerous ways for various sectors. Social media, for example, works towards visual content. Facebook posts with images receive 2.3 times greater engagement and tweets with images receive 150x times more retweet. According to research, the entire population shares over 3.25 billion photos per day. AI can be used to analyze images and understand consumer needs, patterns and behaviors. As per AI, advertising is based on intelligence and intuition, and marketers leverage winning technologies to collect and analyze data for predictive marketing. This is the age of smart digital ads. IP-address based assumptions are no longer valuable. AI has made it possible to learn about every aspect of your prospect’s needs and requirements. Using analytics, CRM and social data lead to higher marketing campaigns ROIs. Yet these have been complex tasks for accomplishing. Machine learning, an AI application, makes it easier to identify trends and commonalities in buyer behavior. This enables digital marketers to evolve multi-dimensional strategies that produce marketing communication designed as per the user’s needs. Customers receive the correct triggers at the right time, leading to the next stage of the buying journey. Search engines and search processes have evolved, with the evolution of voice search and hassle-free AI infused digital marketing. AI tracks search queries, online behavior, navigation, and purchase patterns thereby predicting keywords and enabling latent semantic indexing for keywords related to your main keyword. Further, websites provide a chat interface that permits customers to chat directly with agents. It enables the effective handling of requests and convincing responses are the result. Chatbots are based on self-learning and storing information. Thus, tools used include IBM Watson to incorporate natural language processing and learning faculties within a chatbot, for instance. Data initiatives AI and machine learnings are set to influence digital marketing according to MeMSQL research. A Salesforce survey further found that over half of marketing professionals use AI and close to 27% are jumping on to the bandwagon in 2019. 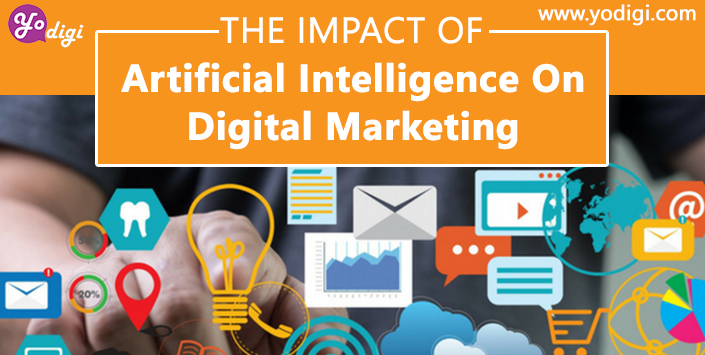 While the amount of information on potential consumers grows, machine learning, deep learning, and natural language processing will become essential for digital marketers. AI generates content and curates it too. Content curation by AI will make it easier for digital marketers to connect with online customers and show them relevant content. This technology is used to make personalized recommendations and suggest what users may find interesting. Digital marketing blogs and articles relevant to what users already evince interest in are another areas where marketers can use AI. Brands can also make use of AI to power and personalize email marketing campaigns in association with preferences and user behaviors. Machine learning analyzes millions of data about customers to assess when to contact the user, the type of email content and the recommended frequency. AI becomes the best option for personalizing email content for the subscriber. Tools like Boomtrain and Phrases generate the right subject lines and catchy content for your email marketing campaign. While AI is not here to replace the job of digital marketers, it can certainly augment and boost online marketing campaigns. With the evolution of artificial intelligence and machine learning technologies, the scope of growth is expanding considerably as marketers improve reach and use predictive analytics to understand online shoppers better. Smart ads and marketing campaigns online are the outcome and this impacts the success of the outreach and advertising efforts too. 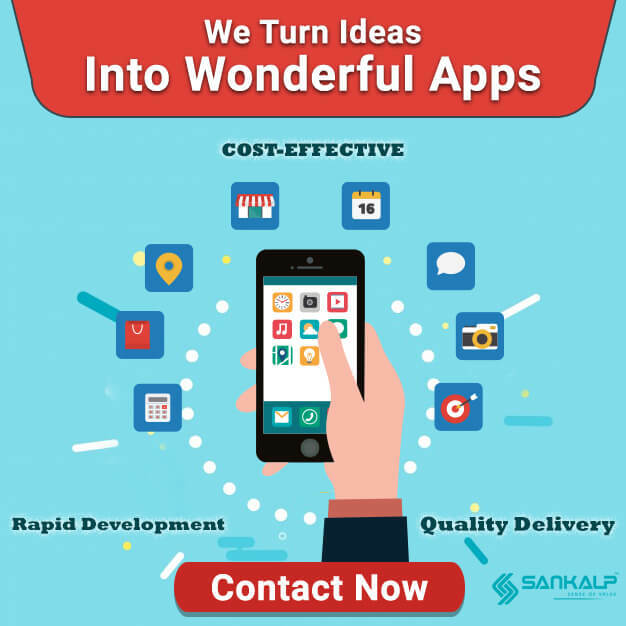 The premier digital marketing company in Pune, India, Sankalp offers software powered by the latest technologies, through its digital marketing solution. 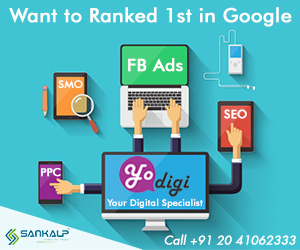 YoDigi offers a competitive edge, whether you want to initiate cross-domain tracking or advanced segments, choose YoDigi’s exceptional digital marketing solutions to offer marketers new and cutting-edge innovative campaigns that resonate with customers. Learn more about YoDigi on Google Plus, Twitter and Facebook. Be sure to visit our official site to know more.